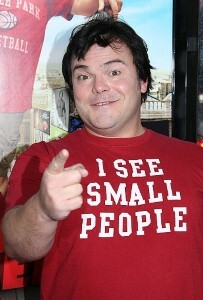 Jack Black may be tubbier than most Hollywood leading dudes (and about five times less charming), but there's no doubt that he's the man. Between his flexible eyebrows and his ability to knock every one of his performances out of the ballpark, it's safe to say this is one guy who will remain on the public radar until he's old and gray. So it should come as no surprise that Black is the one and only aspect of Gulliver's Travels that makes the film worth the price of admission. It's corny, the special effects are over-the-top and the movie appears to have been shot with the prospect of a video game adaptation in mind. Of course, those elements are exactly why kids will leave the theaters beaming. The story follows the adventures of Lemuel Gulliver (Black), a mailroom clerk for the highly esteemed Manhattan-based newspaper the New York Tribune. When he falls for a travel editor (Amanda Peet) and passes off some material as his own to get in her pants (in a completely child-appropriate way, of course), he's suddenly off to the Bermuda Triangle on assignment. And, just like in the novel by Jonathan Swift, his travels so begin. After encountering a storm and being swept away to the mythical land of Lilliput, he meets the island's denizens who are all one-twelfth the size of humans. It's there that he becomes an unlikely hero and eventually winds up saving the day. All in all, Gulliver's Travels will make for a successful afternoon at the movies with the family. No, this isn't Black at his best – but it's definitely not his worst. Remember Nacho Libre? Child-friendly? Gulliver's Travels tells the story of good old' Gulliver, who finds himself on the mysterious island of Lilliput, surrounded by its super-small citizens. The film contains outlandish CGI, silly dialogue, and the comedic skills of Jack Black. Recommended for children ages 5 and up.